Huddersfield Uni has been addressing the forthcoming engineering skills gap with an open day to allow local families to see its work. 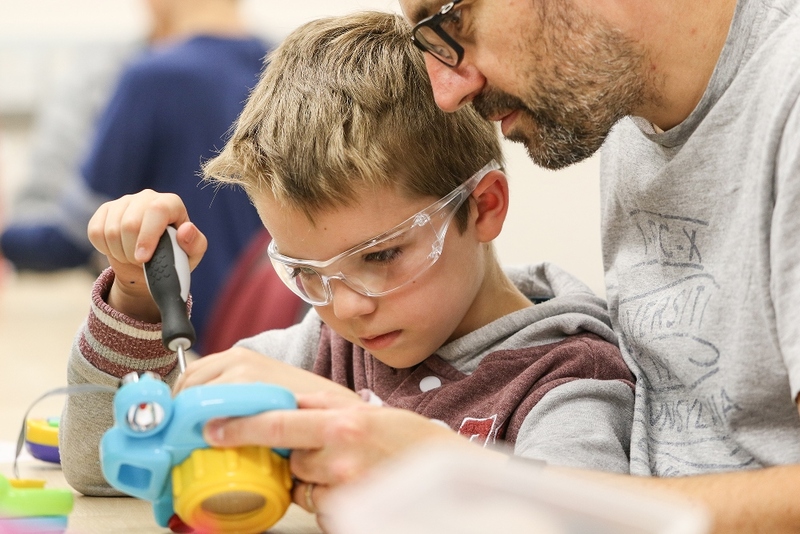 A ‘New Inventions’ poetry workshop, reverse engineering of toys and a peek behind-the-scenes of a world-leading rail research institute were some of the activities local children took part in at the University of Huddersfield’s Engineering Open House Day. The day was part of a nationwide initiative entitled Engineer a Better World by the Institution of Engineering and Technology to encourage more young people to choose engineering as a career. Organised by Carolyn Bishop from the School of Computing and Engineering, Huddersfield’s event was one of the most popular events in the country after seeing a three-fold increase from the year before. “We’re very proud of the work we do here at the University,” said Carolyn. “It’s an absolute pleasure to share our knowledge and passion for engineering with local families at the Engineering Open House Day. “There simply aren’t enough young people choosing engineering as a career in the UK and this event provides a brilliant opportunity for us to inspire and excite the next generation of engineers,” she added. This year’s events included a behind the scenes engineering tour with Professor Ian Glover and a tour around the University’s Institute of Railway Research, where children were given the rare opportunity to wear a hard hat and explore HAROLD, the Huddersfield Adhesion & Rolling Contact Laboratory Dynamics test rig. Dr Matthew Stephenson, a Lecturer in Music Technology, delivered one of three Discover lectures called the Science of Sound – The Physics Behind the Music You Love. He gave an illuminating display of acoustic standing waves in a Rubens’ tube, a novel way of visualising sound waves using a ‘dancing’ pattern of flames emerging from a steel tube. The two remaining lectures were delivered by Dr Leigh Fleming who covered the global challenges facing engineering and Professor John Allport delivered a talk entitled Turbocharging the future. Also popular was the New Inventions Poetry Workshop. Here children’s ideas for novel inventions, such as an ice cream that doesn’t melt or a pair of shoe laces that fasten themselves, were brought to life in poetry by Huddersfield children’s author Gez Walsh. Youngsters were also allowed to take apart toys to discover how they worked in the Reverse Engineering and Electronics labs and they found out about computer programming with Raspberry Pi computers in the Raspberry Jam sessions. Running alongside the events roster was a drop in activity trail with hands-on engineering activities for all the family to take part in. Children were given the opportunity to make doodlebots and balloon powered racing cars, participate in science busking demonstrations and complete a construction challenge. In 2016, the University of Huddersfield was the first university to join the Engineering Open House Day which is now in its third year.